Set up Twitter cards now. Right now. The best tweets create activity. Whether that comes in the form of a retweet, a favourite, a reply or a click. The best way to do this is to tweet things that people find interesting in some way. Once you’ve got something interesting to tweet, other factors come into play. When should you tweet it? Should you mention someone in the tweet? Should you include a link or a photo? The answers to some of these questions are subjective, but when it comes to a link and an image or a video, if you have them, the answer is, unequivocally, yes. The data is out there for making that statement with such conviction.Twitter’s own analysis shows that, at the individual tweet level, links, images and videos make a material difference to engagement. 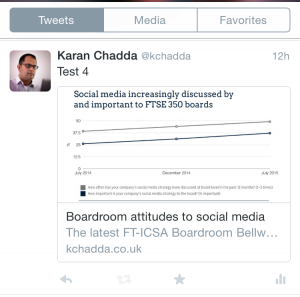 Twitter’s latest mobile app update will make the increased engagement greater still. Twitter cards are a way of embedding rich media into tweets. If you tweet a link to a website that has cards set up, your tweet will appear in people’s feeds with things like page headlines, excerpts and images. At a more advanced level, cards can have calls to action, buttons to download apps or play media. The newest version of Twitter’s mobile app uses new styling for Twitter cards, providing greater screen real estate for links from sites that have set up cards integration. The difference between links from sites without cards integration and those with is now incredibly stark on the mobile app. Website administrators should take note of these changes. Every link shared on Twitter from a site that has not integrated cards is underperforming unless the people tweeting take the time to upload images themselves. We should be making it easy for people to share our content effectively; it’s good for content publishers and it’s good for tweeters. Twitter cards are important across all devices because they offer a richer experience. On mobile, cards now make a massive difference to how your content appears in feeds. We’re constantly being told about the shift to mobile, however, Twitter isn’t shifting to mobile, it is mobile. In the UK, 80% of users access Twitter using their mobile. This only emphasises the importance of cards integration. If you don’t do it your content will underperform on Twitter. You’re undermining your content and those sharing it.